B&H Presents "Rock & Roll Photography with Deborah Feingold"
No guarantees you will come out of this presentation a star. But, you will learn some useful tips on working with them. This presentation takes a look at Deborah’s work from the last 35 years of photographing musicians and other people of notoriety. Permalink: B&H Presents "Rock & Roll Photography with Deborah Feingold"
A photographer friend of mine – James – recently asked me to shoot his engagement pictures. 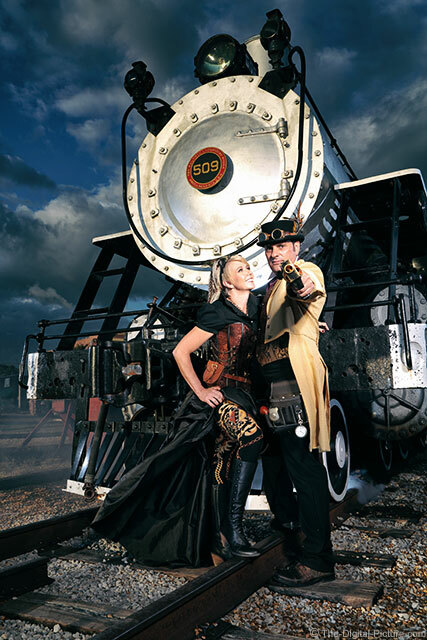 He and his fiancée were planning a steampunk wedding and wanted engagement pictures to match the theme. If you're you've never heard of "steampunk," check out Wikipedia for a good introduction to the science fiction sub-genre. James and Amy had spent countless hours hand crafting or altering Victorian age clothing, accessories and props. They wanted their engagement photos to showcase their passion for the genre. And considering James is a fellow photographer, I really wanted to bring my A-game to this shoot. We planned the shoot for the late afternoon. I arrived at the location about 30 minutes early to scout out the location, determine my shooting angles and set up my gear. This is an important step if you shoot with off-camera flash – arrive early. Setting up light stands, wireless triggers, light modifiers and power options is time consuming. Arriving early allows me to hit the ground running once your clients arrive fresh on the set. While setting up I realized that it was hotter than I thought it would be when I planned the shoot. About 20 minutes into setup I was already sweating through my t-shirt. I knew James and Amy would be wearing multiple layers of clothing (they had sent me a preview of their outfits). If I was already hot, they were going to be much more uncomfortable than I was. I decided to purchase a few cold bottles of water from a nearby food vendor so that my clients could stay hydrated throughout the shoot. It was a small – but certainly appreciated – touch. One big challenge for the location was that the front of the train faced the setting sun. This meant that my subjects would be staring straight into the sun whenever they looked into the direction of the camera. This caused two problems: 1) the subjects would be squinting and 2) the direct sunlight would make them even hotter in their multiple layers of clothing. To combat these issues, I set up large 64" umbrella behind the camera's position so that it shaded my subjects from the sun. The umbrella didn't shade them completely, but it allowed the subjects to pose comfortably while the sun was making its way over the horizon in front of them. The shade umbrella also had another benefit – it provided a blank canvas to work with as far as lighting is concerned. It converted the sun into an ambient base instead of limiting it for use as a main light. That means I could position my main light anywhere to sculpt the scene as I saw fit while simply adjusting my shooting variables to obtain the base exposure I wanted (soft, ambient fill light on my subjects). And those small things combined to keep my subjects happy on this shoot. Throughout the shoot, James and Amy stayed fresh, fun and full of ideas. And it really paid off in the end. If you'd like more details on the lighting setup, check out my description below the picture on Flickr. LONDON, 24 September 2014 – Canon Europe, leader in imaging solutions, will be capturing the action on and off the course with an exciting crowd view photo initiative at this year’s Ryder Cup, taking place at Gleneagles, Scotland from 23-28 September 2014. During the competition, Canon will also be providing support for professional photographers and supplying printing solutions behind the scenes. As the Official Supplier of Imaging Solutions for The 2014 Ryder Cup, golf’s premiere team contest where teams from Europe and the United States compete against each other every two years, Canon will be bringing a first to the competition to enhance the spectators’ experience, taking deep zoom panorama shots of the first tee and surrounding fans with two Canon EOS 5D Mark III Digital SLR cameras. The Canon panorama photographs will be captured throughout the week and will be available to view online at www.canon-europe.com/golf, The Ryder Cup Spectator App and shared via Canon’s social media channels. The photographs will be shot in high resolution gigapixel format, and fans will be able to zoom in to the crowd to find and tag themselves, so they can share the experience with their friends and family on social media. The Canon Professional Services (CPS) team will be on site at the 2014 Ryder Cup Media Centre to provide support for accredited photographers with advice, essential maintenance, equipment loans and help with minor repairs. Canon will supply 70 printers and multifunctional devices to The 2014 Ryder Cup organisers for all printing, copying and faxing needs. Canon print solutions will also be used to create commemorative photobooks for players and team captains at the end of the tournament. The Ryder Cup is golf’s premiere team contest, pitting Europe against the United States, and is one of sport’s most prestigious and popular brands. More than 250,000 spectators are expected on site during the six day event, with a further global TV audience of 500 million people across 183 countries. Windows Vista and Windows XP are no longer supported. For multi monitors, supports color management for monitors other than the primary monitor. For EF 24-105mm f/4L IS USM, EF-M22mm f/2 STM, EF-M18-55mm f/3.5-5.6 IS STM, the latest lens data can be used, of which Digital Lens Optimizer's performance has been improved. Supports EF 16-35mm f/4L IS USM. Supports EOS 7D Mark II. Supports EF 16-35mm f/4L IS USM, EF-S 10-18mm f/4.5-5.6 IS STM. 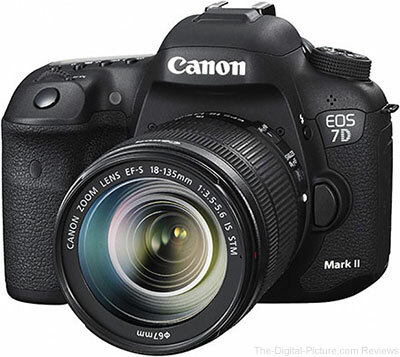 Newly supported EOS 7D Mark II, EOS-1D X, EOS 5D Mark III, EOS 6D, and EOS 70D. Operability improved by changing layout of buttons. Still image cropping function enhanced. Playback of IN point-OUT point supported. "GPS" has been added to the shooting information items for cropped still image. Items added to the shooting information display. Download the Canon Software Updates at Canon USA. 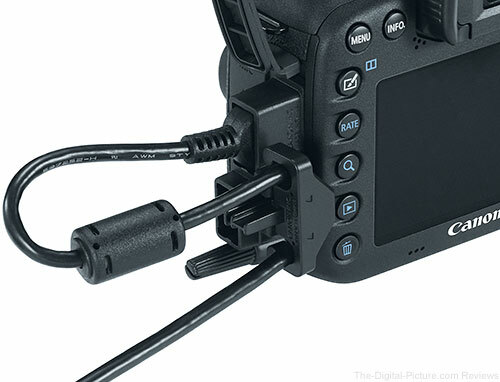 Buried in the press material for the EOS 7D Mark II announcement was an image showing a unique accessory that is being bundled with the camera – a cable protector. 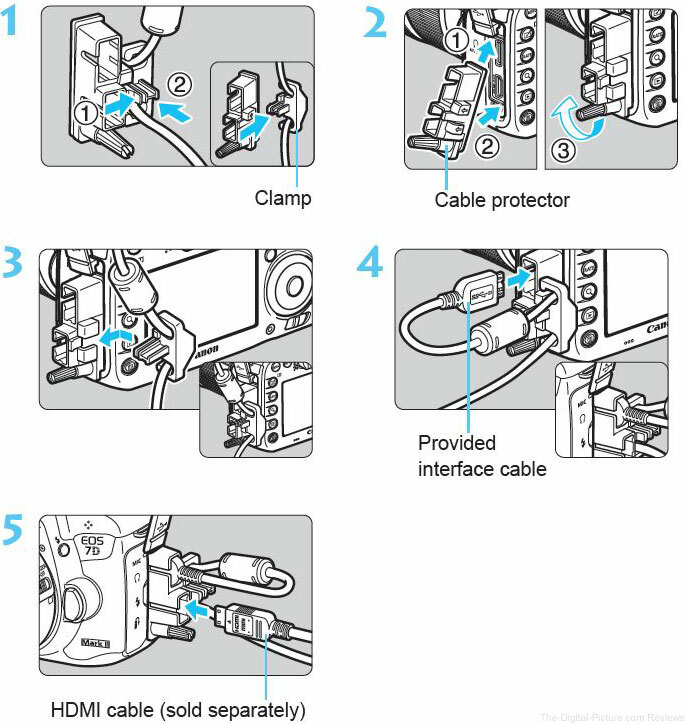 "When connecting the interface cable, also use the provided cable protector. 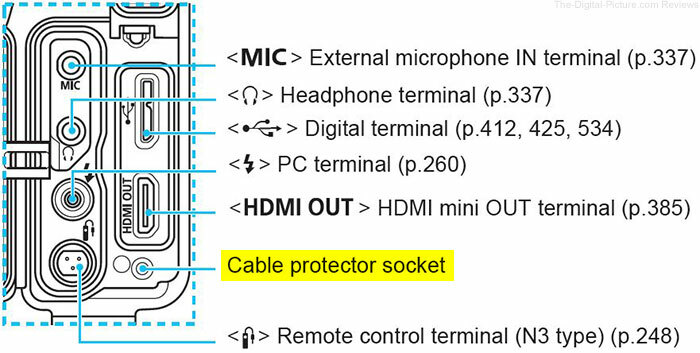 Using the cable protector prevents the cable from accidental disconnection and the terminal from getting damaged." 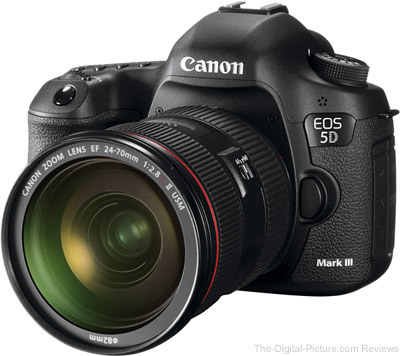 Many of the DSLR Camera rebates that were in effect last month will be continuing through October. However, several new lens rebates were thrown into the mix. Most of the rebates are of the mail-in variety but a few are instant rebates (for example, Speedlite Flashes). Note: Some of the DSLR Camera rebates require an additional lens purchase to qualify. 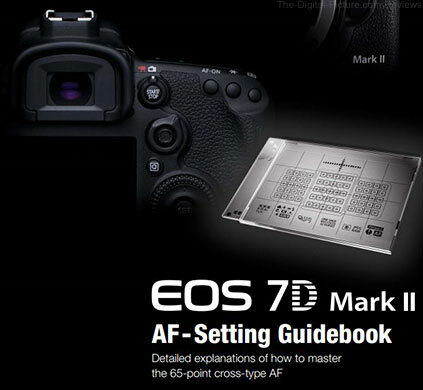 Canon USA has the EOS 7D Mark II AF-Setting Guidebook available for download. Amazon has the Canon EOS 7D Mark II available for preorder. "Nikon has advised D750 DSLR users to manually activate the security setting on Nikon’s Wi-Fi software app for mobile devices, to avoid the risk of unauthorised access to the camera’s images by a third party. 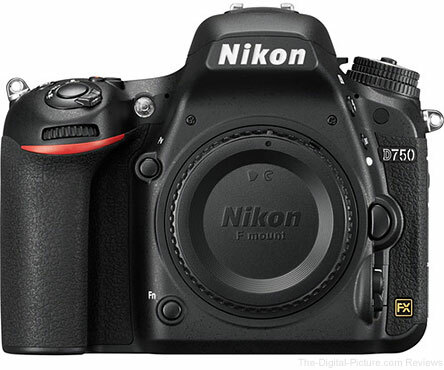 Amateur Photographer (AP)’s technical team has discovered a potential security flaw during their review of a full-production sample of the D750, which went on sale in the UK two days ago. If users do not manually activate the Wi-Fi security settings, via the app, then they could expose the D750’s images to unauthorised access." "If you have Wi-Fi turned on, anyone with a smart device and the Nikon Wireless Mobile Utility can connect to the camera and download images from the memory card without the owner’s permission." You can read the entire article on AmateurPhotographer.co.uk. Canon has issued a product advisory for select PIXMA printers because one clever hacker shed light on a security loophole by installing DOOM on his own Canon printer using its unrestricted web interface. Canon has released a firmware update for the eligible PIXMA printer models listed below to enable access to the security option to set the administrator password. The security option to set the administrator password has been added to the Remote UI* menu for eligible models. By setting the administrator password, you can protect your printer settings from being changed by unauthorized persons other than the administrator. If the printer is connected to a network, we recommend that the printer’s firmware be updated and the security password be configured. *For more information on how to access and use Remote UI please, click here to access the model list. Choose the model. Type “Remote” into the Gooole Customer Search box. Press Enter for a list of results. Print the nozzle check pattern to determine the firmware version the printer is running. The Firmware version will be listed on the bottom of the nozzle check pattern sheet. For instructions on how to print the nozzle check pattern sheet, please review the User Manual. Access to the Online Manual is available by clicking here and selecting the printer model. Choose the “Security” menu item. “Register the administrator password?” Choose “Yes”. When you register an administrator password, password authentication will be required upon starting Remove UI.” Choose “OK”. Admin password registration - Enter an alphanumeric password no longer than 32 characters. The password is case-sensitive. Please save the password in a safe place as you may need it in the future. Photographer David Young has developed a free app that allows you to use Google Glass as your light meter. You can read more about the developer's inspiration on his site, LeicaLux.com. Download Google Glass Light Meter. 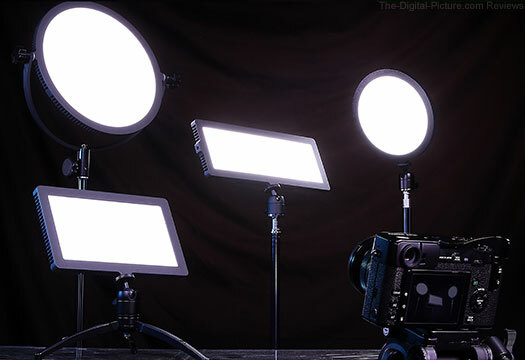 Waukegan, IL – September 24, 2014 – Fotodiox Pro, a leading manufacturer and distributor of high-quality photography and videography accessories, has announced their newest concept in LED lighting: the FlapJack LED Edgelight series. Designed to be lightweight, portable and easy to set up, the FlapJacks produce soft, even light that is ideal for almost any shooting scenario, like impromptu interviews, capturing beautiful portraits or even shooting tabletop food or product photography. Their interior diffusion materials eliminate the need for additional softboxes, and each of the four models can easily fit into a messenger or camera bag, making them a truly complete lighting solution – right out of the box. Rather than using forward-facing LEDs common in conventional panels, the FlapJacks’ LEDs are mounted around their outer edge, aimed inward at layers of diffusion material. Instead of producing a direct beam, they produce bounced light that creates a soft, even glow with no hotspots. They are the perfect solution for filling in shadows, shooting glamour portraits or expertly lighting small spaces, like car interiors or office cubicles. Furthermore, the FlapJacks feature an elegant form factor – each measuring less than 1/2" at its thinnest point – and can be placed almost anywhere. Their compact design makes it easy to mount them to light stands, tabletop tripods, light clamps or even a camera’s accessory shoe. The FlapJacks are so lightweight that they can even be mounted with Velcro, cord or tape, making it easier than ever before to get creative with light placement. Amazon carries the new Fotodiox FlapJack LED lights. 129 new camera/lens combinations have been added to the DxO Optics Module library for DxO Optics Pro and DxO ViewPoint, providing support for Olympus, Pentax, Samyang and Zeiss lenses for Canon, Fuji, Nikon, Panasonic, Pentax and Samsung cameras. To see the combinations supported by DxO Optics Pro and planned combinations, click on the link below then select the second tab. B&H carries DxO Optics Pro 9 and DxO Viewpoint 2. An issue that sometimes prevented appropriate exposure control with interval timer photography has been resolved. B&H carries the Nikon COOLPIX A digital camera.